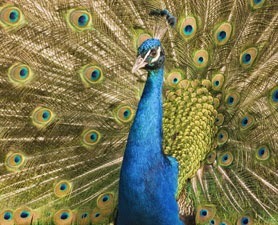 When a peacock spreads out its train the feathers form a huge display. Near the end of each feather is a colorful, circular object that looks something like an eye and the feathers are positioned just right so that the eyes, or ocelli, are beautifully arrayed across the entire display. The iridescence of the eyes comes not from the material itself, which isn’t colorful, but from its finely-tuned nanostructure which reflects the light to produce the different colors. Such eye-spot feathers are found in three different bird genera and according to a new evolutionary analysis of their genetics, they would likely share a common ancestor as has always been expected by evolutionists. There’s only one problem. The analysis also finds that other bird genera that are without these ornamental eyespots, are also closely related to these genera that do have eye-spot feathers. This is yet another evidence, in a long, long list, which demonstrates that evolution is not a simple, parsimonious explanation that, in a stroke, easily explains a set of disparate and otherwise unlikely or confusing observations. Rather, evolution is a complex theory with a never-ending list of epicycles that are needed to explain a wide variety of evidences that are inconsistent with the basic theory. This makes evolution a tautology. Cornelius Hunter: This is yet another evidence, in a long, long list, which demonstrates that evolution is not a simple, parsimonious explanation that, in a stroke, easily explains a set of disparate and otherwise unlikely or confusing observations. A classical epicycle is a causeless correlation. Sexual selection and mutation are observable mechanisms, and the existence of a simple mutational pathway is a testable hypothesis. But we are starting to understand your point of view. What you call epicycles are merely events in evolutionary history. Next thing you know, they'll have to include cometary impacts and moving continents as explanations! No, don't get hung up on whether there is a cause involved. An "epicycle" is merely an explanation that is invoked to explain the observations, and that adds complexity / reduces parsimony. I once debated an evolution professor who claimed evolution had great explanatory power. But of course that is not true in the scientific sense. If a design falls into the expected common descent pattern then it is said to be homologous. If not, then analogous. These are simply labels used to describe the evidence. There is no explanatory power beyond the evidence itself. Evolution is a tautology. And, as exemplified in the OP, evolutionists are routinely wrong in their labeling, and have to switch it around when new evidence comes in. Cornelius Hunter: No, don't get hung up on whether there is a cause involved. Heh. Whether there's a cause or a testable hypothesis IS important. Cornelius Hunter: An "epicycle" is merely an explanation that is invoked to explain the observations, and that adds complexity / reduces parsimony. Like comets that wipe out the dinosaurs, you invoke explanations that are supported by the evidence or subject to testing. Cornelius Hunter: If a design falls into the expected common descent pattern then it is said to be homologous. Well, yeah. That's what homologous means! Cornelius Hunter: These are simply labels used to describe the evidence. The evidence for common descent is the overall pattern, including the nested hierarchy and fossil succession. Cornelius Hunter: Evolution is a tautology. The paper proposes a testable hypothesis. Zachriel: The evidence for common descent is the overall pattern, including the nested hierarchy and fossil succession. Ah, Zach's daily bald assertions and mythologizing. There is no overall pattern of evolution. The fossil succession carries little to no signal of evolution, and actual fossils nearly always display anti-evolutionary trends. There is no objective "nested hierarchy of common descent". Phylogeny is plastic and accommodating to opposing outcomes. You're in denial about it. You don't even have the criteria for positively identifying a homologous trait versus a convergent one. And you think the dinosaur-killing-comet story is exemplary of a testable hypothesis? That explains a lot about your posting behavior. The fossil succession shows a clear pattern, from single-celled organisms to primitive multicellular forms to chordates to vertebrates to gnathostomes to tetrapods to amniotes to mammals to primates, to point to just one lineage. lifepsy: There is no objective "nested hierarchy of common descent". Phylogeny is plastic and accommodating to opposing outcomes. The broad pattern is much the same today as it was a century ago, with mammals nested in tetrapods nested in amniotes nested in vertebrates, etc. lifepsy: And you think the dinosaur-killing-comet story is exemplary of a testable hypothesis? Sure it's testable, such as the global presence of the iridium anomaly. If we are going to take a "big picture" view, then I think that we have to consider the evidence for design. There is all that complexity at so many levels. "If we are going to take a "big picture" view, then I think that we have to consider the evidence for design. There is all that complexity at so many levels." Not only do we see incredible fine tuning in biological systems but also in the whole universe. The anthropic principal is a death blow to the whole godless evolutionary ideal. natschuster: There is all that complexity at so many levels. Yes, and evolution provides an explanation for that complexity that is consistent with the nested hierarchy, the fossil succession, and has made many successful empirical predictions. It seems to me that Darwinism is not a very good explanation for the complexity, just too much specificity, irreducible complexity and time constraints. And design is a good explanation for fossil record, which looks just like a museum display of the development of technology. And since there is so much ambiguity and overlap and mixing and matching in the nested hierarchy, just like in human made artifacts, e.g. the post above, I'm thinking that maybe design is just as good an explanation as evolution. If you weigh all the evidence, it might just be on the side of design. Oh, I forgot to mention that it's evolution combined with extinction of the species near the borders that is needed t explain the nested hierarchy. That's hardly parsimonious. natschuster: It seems to me that Darwinism is not a very good explanation for the complexity, just too much specificity, irreducible complexity and time constraints. What do you mean by "too much"? natschuster: And design is a good explanation for fossil record, which looks just like a museum display of the development of technology. Not particularly. Technological development has rampant crossings. The fossil record suggests happenstance kludges. No, it's not. That's why we wanted you to provide a nested hierarchy of artifacts, such as buildings, so we could look at that claim in detail. You have yet to do so. natschuster: Oh, I forgot to mention that it's evolution combined with extinction of the species near the borders that is needed t explain the nested hierarchy. Extinction is a well-supported phenomenon. Indeed, the vast majority of species that have ever existed have gone extinct, so the creation of gaps between taxa is inevitable. Sorry, it was Nic whom we asked to provide a nested hierarchy of artifacts, such as buildings. However, you might try to provide one yourself. "Too much" means very unlikely that it could be all by accident. Organism have lots of crossing as well, e.g. the eyespots mentioned above. And the fossil record merely shows different species living at different times not one species changing into another. Looks just like the "evolution" of technology. And it's funny how it is just the many, many species that were near the borders of the groups that became extinct. natschuster: "Too much" means very unlikely that it could be all by accident. Evolutionary adaptation isn't "accident", so that would be a strawman argument. Evolution adaptation is specifically proposed as a mechanism of generating complex functional structures, and there is significant evidenced that the mechanism is more than capable of doing so. natschuster: Organism have lots of crossing as well, e.g. the eyespots mentioned above. Yet, there is still a very strong signal of the singular nested hierarchy. You might compare to a nested hierarchy of artifacts, such as buildings. natschuster: And the fossil record merely shows different species living at different times not one species changing into another. The dividing line between species isn't always distinct, but there are many fossil series showing gradual change. It starts with a random mutation, that is an accident. And, to explain something irreducibly complex like a flagellum, you need to come on to a whole bunch of hypothetical, theoretical functional intermediates. And you need to come onto a whole bunch of luck to explain the evolution of something as highly specified as a typical protein. The signal for design is really, really, strong. Its all over every organism. Anyway, I'm not sure how string the signal for a nested hierarchy is. There is so much ambiguity, overlap, and contradictory signals. And I keep on reading that the dozen of so transitional series are transition between major groups. And the real ancestors are still missing. What we have are side branches with a transitional feature. If the real ancestors really existed why can't we find them? And if species evolved from other species why can't we find that in the fossil record? The signal for design is really, really, strong. Its all over every organism. Terrific. Any guess as to how the flagellum was designed? Gee, I'm not sure we know who designed Stonehenge either. Stone axes and pointy stick s might have been designed by humans, chimps, or some proto-human. I guess that, since the evidence from the rest of the universe points toward an entity that closely resembles the God of Abraham, then the most parsimonious explanation would be the God of Abraham. And how do designers design anything? Fist there is this intangible thing called a thought, an idea, etc. I understand that science is having a real hard time explaining how that happens. So it may be something spiritual, supernatural, etc. A supernatural being should have no trouble thinking. Perhaps you might provide the evidence and logic that leads to that startling conclusion. And how do designers design anything? Fist there is this intangible thing called a thought, an idea, etc. Spiders have intangible ideas? The Colorado River ? DNA? The tree that became the first wheel? I understand that science is having a real hard time explaining how that happens. So it may be something spiritual, supernatural, etc. A supernatural being should have no trouble thinking. How do you know that a supernatural being thinks? Or is a being? Or how a supernatural being interacts with the natural? Does it manipulate existing matter or create new matter? I understand that theism is having a real hard time explaining how that works. natschuster: The signal for design is really, really, strong. Can you provide an objective test? natschuster: Anyway, I'm not sure how string the signal for a nested hierarchy is. Theobald, A formal test of the theory of universal common ancestry, Nature 2010: "Among a wide range of biological models involving the independent ancestry of major taxonomic groups, the model selection tests are found to overwhelmingly support UCA irrespective of the presence of horizontal gene transfer and symbiotic fusion events. These results provide powerful statistical evidence corroborating the monophyly of all known life." natschuster: What we have are side branches with a transitional feature. If the real ancestors really existed why can't we find them? We may have direct ancestors, but there's no way to know for sure. Turns out that its hard to tell your cousins from your siblings from bones alone. Consequently, we posit transitionals meaning exhibiting both primitive and derived traits, and test for those. natschuster: I'm not sure we know who designed Stonehenge either. Really? Pretty sure it was a peculiar species of Hominid known for building in stone. Did you think otherwise? about humans, like our mind, consciousness, etc. that is hard to explain without supernatural stuff. That indicates that the Creator has a special affinity for humans. See, this Creator is looking more and more like the God of Abraham, Humans have a need to seek and connect to truths beyond the mere reality of physical existence. That is why we have spirituality, religion, etc. That s evidence that we were created with a soul. Then we have a moral sense that is hard to explain in Darwinian terms. That means that the Creator expects us to behave morally. He also gave us the capacity to do bad thing. That means we have free will. All this sounds a lot like the God of Abraham. It all fits. "Spiders have intangible ideas? The Colorado River ? DNA? The tree that became the first wheel?" I guess spiders to have intangible ideas. Do you have a better. And to the best of my knowledge the Grand Canyon does not show a whole lot of evidence of design. And DNA was designed, yes. It contains and transfers the design, like a computer. And a tree was designed to be a tree, The human designs the wheel. "How do you know that a supernatural being thinks? Or is a being? Or how a supernatural being interacts with the natural? Does it manipulate existing matter or create new matter? " I'm really not sure how a supernatural entity thinks. I only have how I think to go on. But evolutionist claim to know exactly how a supernatural entity would create every detail in the Universe, so why can't I indulge in a little speculation? And I guess a supernatural would both create new matter, and interact with preexisting matter. I guess an objective test for design would be the fact that the apparent design we see al over the place Is really, really hard to explain in another way. And you can prove anything using mathematical models. It all depends on your programming and inputs. And monophyletic origin could be a single designer as well. "Really? Pretty sure it was a peculiar species of Hominid known for building in stone. Did you think otherwise?" But which hominids? And why? See, we don't need to know all the details to conclude design. "I guess an objective test for design would be the fact that the apparent design we see al over the place Is really, really hard to explain in another way." I apologise for the intrusion in this discussion, but I cannot resist. Natschuster, can you not recognise how ridiculous is your proposed “objective” test? Again and again you cannot say better that if a complete explanation is still not available your favourite explanation should be per default. What were to start to present any piece of positive evidence for the design, so for the beginning? Okay: we know from experience that it is really really hard to make things that have certain characteristics like irreducible complexity.without design. Its hard to explain things with highly specified complexity without coming on to design. If you see a leather pouch attached to two pieces of string, you assume that it was designed to be a sling, as simple as it is. So organism have lots and lots of these very characteristics. Ergo, it is really hard to explain organisms without coming on to design. "Okay: we know from experience that it is really really hard to make things that have certain characteristics like irreducible complexity.without design." Have you understand my questions to Natschuster? Which "objective test" are you proposing for the design? Repeating the same argument of Natschuster doesn't add much to the discussion. Sorry Shevi is my daughter, She forgot to sign out. Anyway, if you scientists find something like stones arranged in a circle, they assume that it was designed because it looks designed and it is really hard to explain it without design. Why isn't that an objective test. It's like this. There is no good naturalistic explanation for the origin of the Universe, so wee need a supernatural one. There is no good naturalistic explanation for the apparent fine tuning to accommodate life, so we need a supernatural one. To be accurate, it is not logically impossible that we have such an entity if one exists. and shows evidence of planning, that is, a mind. To know if this universe is planned first you would have to determine if the theoretical supernatural explanation could or did plan and if it did what was the goal. I think we are a long way from giving our conjectured supernatural explanation a potentially anthropomorphic mind yet. "Anyway, if you scientists find something like stones arranged in a circle, they assume that it was designed ..."
It depends. But not after having examined also other possibilities not excluding natural phenomena. In any case I would investigate case per case exactly because I am not aware of an objective test to detect design (or you are thinking to CSI or similar). Scientists are not impressed by “… it was designed because it looks designed”. You cannot call this an objective test. Natschuster said:"Sorry Shevi is my daughter, She forgot to sign out." I have also a daughter, so I understand it. Excerpt: A study published online by PeerJ on Jan. 2 detailed the examination of a startlingly complete and pristine specimen of an ancient, dinosaur-era bird: Hongshanornis longicresta, which flapped throughout what is now China roughly 125 million years ago during the early Cretaceous Period. Roughly 90 percent of the skeleton is complete, with wings and tail so finely preserved that the outlines of feathers and what may be dark color bands on the tail can still be seen. That high level of preservation — particularly around the wings and tail — has allowed the team to perform an aerodynamic analysis of the bird, revealing how it likely flew. Michael Habib, assistant professor of research at the Keck School of Medicine of USC, analyzed the shape of the wings and tail and determined that the bird “flitted about,” bouncing through the air with bursts of flapping. The flying style is far closer to that found in modern birds than what was supposed of ancient flyers — which have been thought to rely more on gliding due to a lack of enough muscle mass in flying appendages to achieve flapping bursts. But if it was already “essentially modern” in the ancestors, and already integrated with the flight systems, where is the time for natural selection to have supposedly produced it? Excerpt: In four of the biggest climatic-vegetational events of the last 50 million years, the mammals and birds show no noticeable change in response to changing climates. No matter how many presentations I give where I show these data, no one (including myself) has a good explanation yet for such widespread stasis despite the obvious selective pressures of changing climate. "Our results suggest that, for Aves (Birds), discord between molecular divergence estimates and the fossil record is pervasive across clades and of consistently higher magnitude for younger clades." Excerpt: Charles Darwin's theory of evolution set out in the Origin of Species has been proven wrong by scientists studying ovenbirds. To save you some time. Start at about 109:00 and follow Rosemary for a few minutes till at least 112:00. Then go to 146:30 and listen to Peter. Before this is the inane prattle by two of Stanford’s finest who do not understand that the Grants are saying that the whole evolution thing is a crock. According to Quantum Physicist Jim Al-Khalili, the phenomenon Quantum Entanglement in Robins is "nothing short of miraculous." bornagain77: a closer examination revealed claws at the end of the bird’s wings and tiny teeth in its beak. Heh. Just like a modern bird, except for the teeth and wing claws. bornagain77: Before this is the inane prattle by two of Stanford’s finest who do not understand that the Grants are saying that the whole evolution thing is a crock. Apparently not, as the Grants talk about evolution and natural selection occurring. In any case, you do understand interspecific hybridization isn't some new concept, and is very frequent in avian species. If science in the seventies tell the people we are facing a new glacial era, in the nineties we were facing the Global warming and now that we are facing the climate change, do not blame the people. Blas, are you suggesting that a global ice age would be a disaster but the effects of global warming, such as the loss of entire coastlines and the temperature impact on food supplies would not? An asteroid is due to hit our planet. The resulting impact could cause climate change as well. And that's just one threat that we know about. These are all disasters, regardless and we need to take steps to so we can quickly change out emissions if need be, without causing our own disaster in the loss of power, manufacturing, etc. That we live in a world in which there are threats we cannot predict and can cause us to go extinct is not a new notion. Well, that is, unless you think we live in a world designed just for us. If so, that could be a bitter pill to swallow. Nope,but if the vast majority of the data points to that conclusion perhaps it would be wise to consider it. The question is, how are you so sure that they are wrong? Fox News says so? "The conscious and intelligent manipulation of the organized habits and opinions of the masses is an important element in democratic society. Those who manipulate this unseen mechanism of society constitute an invisible government which is the true ruling power of our country..."
If the government said there was no global climate change, would you believe that there was? Because they have. If the government said only the few scientists who studied the climate that claimed there is no climate change were correct, would you then believe that the vast majority that does is correct? They have done that as well. "Nope,but if the vast majority of the data points to that conclusion perhaps it would be wise to consider it." But the same majority of data pointed in another direction forty years ago and in another fifteen years ago why bother with what the data say now. Before jeopardize the development of my country I want more accuracy. Futhemore, the people that produce more CO2 by person are north americans and europeans. Then if you are so worry about climate change spread ebola virus there. The tidal gauges in New York harbor have measured a 15 inch increase in sea level in the last 150 years. When will climate change be seen as a problem? When the Florida Keys become the Florida reefs? When rain stops Holland? Let's not be naive about mind control games by governments/corporations crooks. That's good position generally speaking. There are lots of dumb and naive people on my "friends" list on Facebook. That's why I come here and expect,like Velik said people capable of critical thinking and somewhat skeptical of scientific, political or sociological consensus. Oh, I'm not denying a little skepticism is a healthy thing especially where politicians are concerned. Taking a harder look at the "evidence" for Iraq's alleged support for al-Qaeda and its WMD program, for example, might have saved a lot of lives - and money. On the other hand, at the other end of that spectrum are people like the "birthers", who refuse to accept that Obama is an American citizen born in Hawaii or the "truthers" who are convinced the US government was behind the 9/11 attacks. What would you say is the difference between the two - assuming yo think there is any? Heh, yep. Hongshanornis is essentially a modern bird that shows up over "50 million years" before the dromaeosaurid theropods they were supposed to have evolved from. That must be the "fossil succession" you were alluding to earlier, Zach? All science so far. Hongshanornis is from 125 million years ago. Dromaeosaurids first appeared 160 million years ago. Not sure your point. In any case, species, such as Sinornithosaurus, may not be on the direct line of descent to birds, but have features that strongly support a close relationship. See Swisher et al., Cretaceous age for the feathered dinosaurs of Liaoning, China, Nature 1999. Ian, one thing to keep in mind is that were talking to people with the theological commitment that human extinction before the return of Jesus will not occur, any suffering we experience until then is under Gods control and that God promised never to destroy the earth by flood again. The earth is designed for us, so that somehow translates into the earth compensating for our actions, in some kind of Lamarckian sense. And the details of exactly how that's works is irrelevant, as it is with biological adaptations of organisms, because that's what God supposedly wants and there are no "details" as far as God is concerned. IOW, if God doesn't want there to be a climate disaster, there won't be one. And if he does, there will be. We're just along for the ride. "Future climate. Having presented evidence that major changes in past climate were associated with variations in the geometry of the earth's orbit, we should be able to predict the trend of future climate. Such forecasts must be qualified in two ways. First, they apply only to the natural component of future climatic trends - and not to anthropogenic effects such as those due to the burning of fossil fuels. Second, they describe only the long-term trends, because they are linked to orbital variations with periods of 20,000 years and longer. Climatic oscillations at higher frequencies are not predicted. One approach to forecasting the natural long-term climate trend is to estimate the time constants of response necessary to explain the observed phase relationships between orbital variation and climatic change, and then to use those time constants in the exponential-response model. When such a model is applied to Vernekar's (39) astronomical projections, the results indicate that the long-term trend over the next 20,000 years is towards extensive Northern Hemisphere glaciation and cooler climate "
Before jeopardize the development of my country I want more accuracy. Futhemore, the people that produce more CO2 by person are north americans and europeans. Then if you are so worry about climate change spread ebola virus there. Let's not be naive about mind control games by governments/corporations crooks. That's good position generally speaking. There are lots of dumb and naive people on my "friends" list on Facebook. That's why I come here and expect,like Velik said people capable of critical thinking and somewhat skeptical of scientific, political or sociological consensus. You see. I have two options then, become reach to avoid the impact of climate change or reduce the CO2 emission to avoid climate change. Which do you think has better chances of success? The problem is that you want to resolve tour leaky roof problem burning my house. As an individual, becoming rich is the better option. As a member of the human race, the latter. Ebola like climate change does not respect political boundaries. There is no our and your. "As a member of the human race, the latter." "Ebola like climate change does not respect political boundaries. There is no our and your." But in wealth there are boundaries, you live in a rich country that already changed the enviroment and are emitting CO2 more than mine. Why do you assume the rich are the fittest? Not exactly, wealth provides more options,not guarantees. you live in a rich country that already changed the enviroment and are emitting CO2 more than mine. So you are not arguing that climate change is not happening but you should have the opportunity to cause it yourself. Good point.....nevertheless regarding climate issues I'm siding with skeptical climatologists. "Why do you assume the rich are the fittest?" Who survive is the fittest that is what ToE says. "Not exactly, wealth provides more options,not guarantees." Every day low probability events happen. "So you are not arguing that climate change is not happening but you should have the opportunity to cause it yourself." Science predicting the future, unless in a tightly controlled enviroment, is not more accurate that predicting it by throwing cards. The climate change, that is a fact, probably is getting warmer, how much and how much that warming is "anthropogenic" is debatable an unpredictable. Cutting your leg because of that a la Angelina Jolie it is not smart. That's is fine of course, my only problem was your reason seemed not to be climate data driven . Science predicting the future, unless in a tightly controlled enviroment, is not more accurate that predicting it by throwing cards. That would be news to planetary scientists. Less and less as more data is gathered. Cutting your leg because of that a la Angelina Jolie it is not smart. I don't believe it was her leg but with her family history it might be. Excerpt: It’s the only mimic insect I know that paints an entire scene. It looks like a watercolor. Two red-eyed muscomorph flies feed from fresh bird droppings, complete with light glinting off their wings. I’ve never seen anything like it! Excerpt: But a closer examination of the transparent wings of Goniurellia tridens reveals a piece of evolutionary(?) art. Each wing carries a precisely detailed image of an ant-like insect, complete with six legs, two antennae, a head, thorax and tapered abdomen.